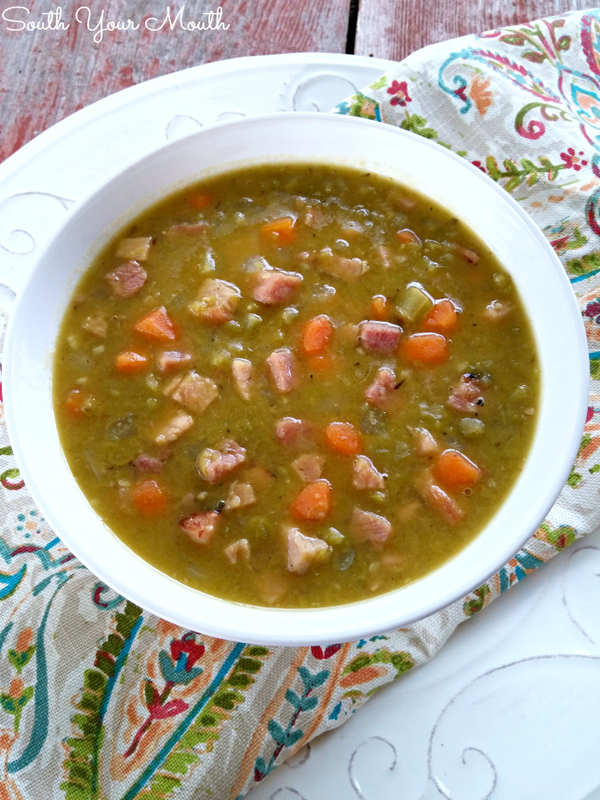 A classic split pea soup recipe with ham perfect for using leftover ham or ham bones! One of the things I love about Easter is that we always have lots and lots and lots of leftover ham after Easter dinner! 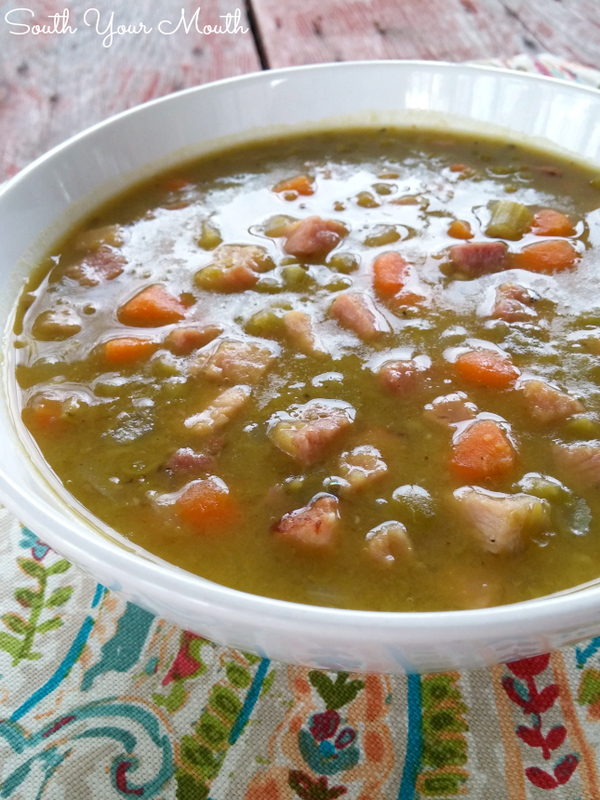 I’ve always reached for dried beans when I want to make soup with leftover ham (or a ham bone) but I wanted to try my hand at split pea soup so I thought I would then share the recipe with you in case you want to make some of this delicious soup with your leftovers too! I didn’t grow up with this so I had to consult ye olde internets to help me get down some basics for the soup. The internets told me this is a popular soup in Canada (don’t yell at me if that’s not true). I immediately called my mother-in-law to ask if she ever made it. But then we got to talking about forty other things and I can’t remember what she said. Lucky for me she called a week or so later while in the midst of having a bunch of her girlfriends over and they talked me through the basics. Thanks, ladies! 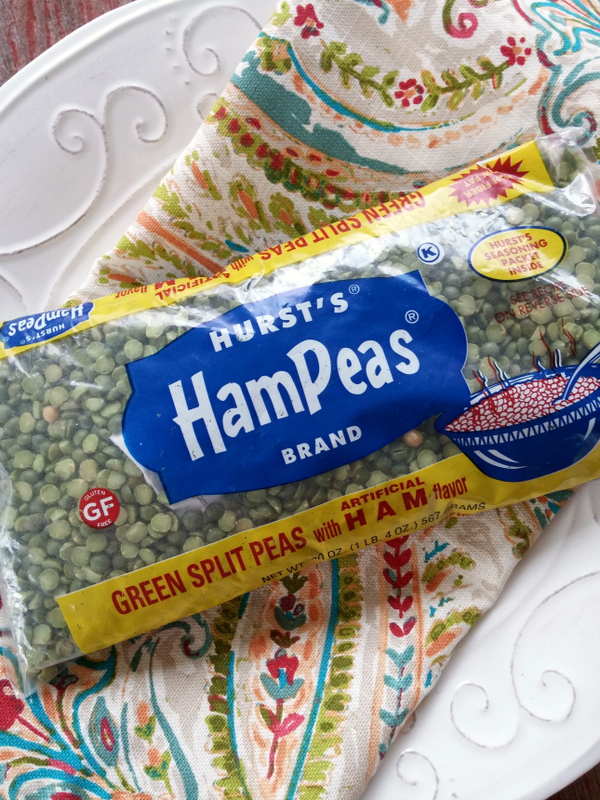 If you can’t find Hurst’s Green Split Peas with Ham Flavor in your local grocery stores, ask for them! My grocery store now carries all sorts of products they didn’t have before simply because I asked for them. Sauté carrots, celery and onion in olive oil for 3 minutes then add garlic and continue to sauté for 2 additional minutes. Add pepper, thyme, broth, ham, split peas (with seasoning packet) and stir well. Bring to a boil then reduce to medium-low heat, cover and simmer for 45-60 minutes or until peas are tender. Feel free to use chicken broth instead of vegetable broth. I wanted the peas and mirepoix to be more at the front of things in this recipe so I used vegetable broth to highlight them. 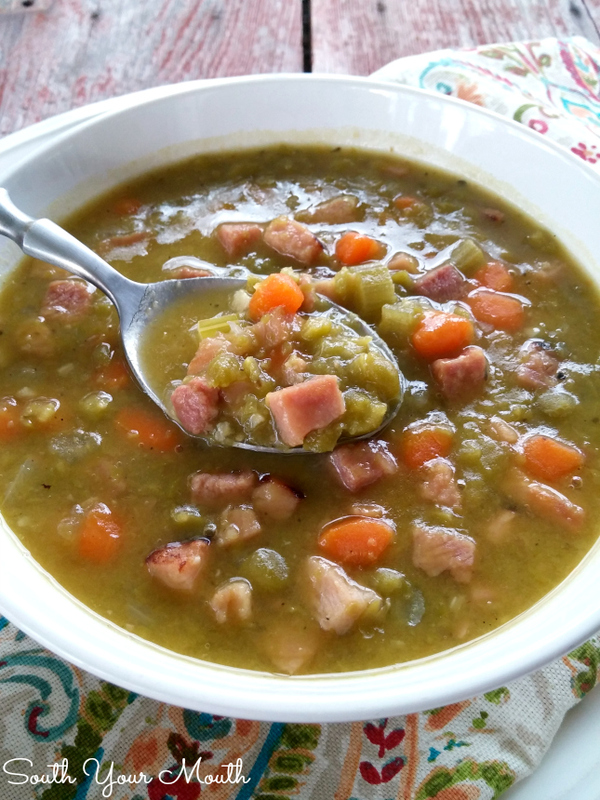 If you can’t find Hurst’s Green Split Peas with Ham Flavor in your market, please ask your grocer for them. Until then, you use any dried split peas then add salt to taste and 1 teaspoon Liquid Smoke. 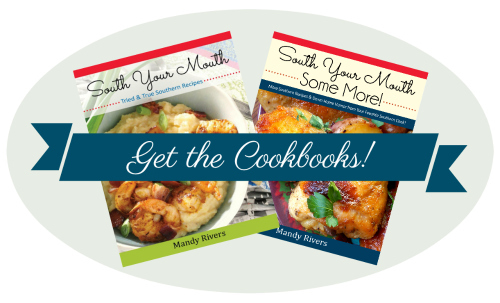 You can also order them online! I imagine you can make this in a crock pot but I’m not sure about cooking times since the peas are so small. I’d start with 4 hours on high and see how things go. I think this would be FABULOUS in bread bowls! This is how I make my split pea soup. A ham base like chicken and beef base is available by the jar (12 oz.) I buy that and can use it for soups, lentils and beans. I also use my immersion blender at the end of cooking to make my soup smoother. All looks good except we use the yellow split peas eh. I didn't realize that! I'll have to buy some yellow peas next time we're up (pretty sure I've never seen them around here). I wonder if the taste is very different? Thanks for sharing! and cook the dry yellow peas with a nice ham bone for flavour!